Workshops and Tours with AIPP* Accredited Professional Photographer Mark Rayner - New 2018 Workshops available for booking. In this full day portrait workshop Mark will take you through the process of setting up studio lighting with a professional two strobe system and supplementary speed-lights. You will learn how to adjust the lights to perfect the correct exposure and control shadows and light drop-off. You will use large soft boxes for beautifully diffused light but you will also experiment with snoots and directional lighting for dramatic effects. 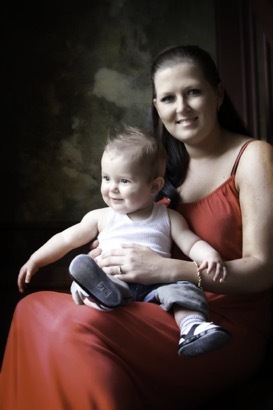 As well a family portrait portrait session, a professional model will join us for indoor and outdoor glamour sessions. After the shoot Mark will guide you through the post processing with the goal of producing a high quality, client ready image. Your favourite images will be printed on amazing high quality metallic pearl paper. * 8:30am Introduction and briefing on camera settings, studio lighting basics, use of natural light. * 9:00am Family portrait session - Natural Light - This session will be outdoors in various settings around the Redcliffe foreshore. * 10:00am Morning tea (working) - we will further discuss the next session and studio lighting set-up during morning tea. * 10:15am Family portrait session - indoor studio lighting. During this session we will have two photographers shooting together (studio lights have two remote wireless triggers). We will also work in a baby shoot during this session (baby cooperation permitting). * 11:15am Glamour model portrait session - indoor studio lighting, speed-light, soft box, snoots etc. * 1:30pm Glamour model outdoors session - natural light, dealing with harsh light conditions. We may choose to continue the indoor session depending on the group dynamics and weather. * 2:30pm Post processing of the days images - batch efficiencies, white balance adjustments, soft lighting effects, skin smoothing and glamour touch-ups. * 3:15pm Continue post-processing through to preparation for web or print. During studio lighting sessions you will also act as assistants to the photographers and models in action. Each participant will set-up the studio lighting from scratch for their studio session. Morning tea, and afternoon tea are provided. Prime or zoom lenses that cover between 30mm to 200mm or longer (call or email to clarify if you are concerned). Laptop with Adobe Photoshop pre-installed. Card reader or USB cable (suitable for your camera) to upload your images. Please note: This workshop is limited to 8 participants. This will ensure that you receive comprehensive personal tuition from Mark. Please book early to avoid disappointment.